Ptolemaic Kingdom. Cleopatra VII (the Cleopatra). 51 to 30 BC. AE 80 drachm. Denomination : AE 80 drachm. Reference : Sear-7955, SNG COP 419. SVORNOS 1871. Size : 25.7 X 27.1 mm. Weight : 16.53 grams. Grade : Fine/VG (for the type, but please note the comments about the reverse in the reverse description). Obverse : Head of Cleopatra right. There is a weak are her head from the ear and above, that is caused by a thin spot on the flan were the dies did not make proper contact with the metal. Reverse : Eagle standing left. Unfortunatly the inscriptions are not struck up. There are many tiny bumps on the reverse that seem to indicate this coin was struck from a rusty pitted die. Not a pretty specimen, but still a visible portrait of this famouse lady. 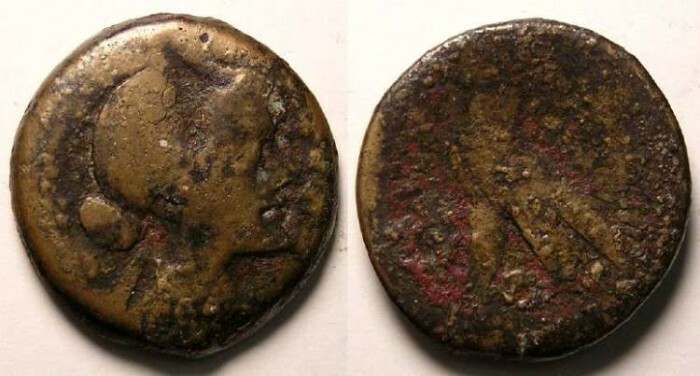 While not a Roman Imperatorial coin, we have included a listing for it under that section because Cleopatra paid such an important role in the final days of the Imperatorial period.